The English Bridge Union is proud to announce that the following people have been awarded the prestigious Dimmie Fleming Award for services to bridge. The awards are made specifically to publicly recognise those who have worked hard promoting bridge locally at County level. 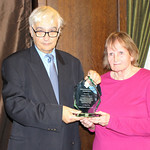 Bob Blackmore, who last August won the first John Armstrong Memorial Award, is now the recipient of the Dimmie Fleming Award for services to bridge. Bob is a player of the highest standard who has won almost every competition in Devon and has represented that County in national events on numerous occasions. He was a founder member of the Exeter Bridge Club, and has been its unpaid financial director since 1994. He has used that position to promote the interests of bridge both for the club and the Devon Bridge Association. Bob largely gave up competitive bridge to take on the role of encouraging young players and those new to the game. 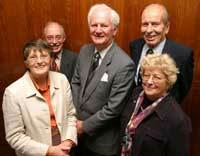 For as long as most people can remember, nobody has worked harder for bridge in Devon than Bob Blackmore. Please click on their names for a mini-biography of each winner. 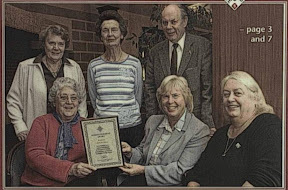 Picture from left, back row: Monica Lucy, Margaret Curtis (who made the presentations) and Mike de Winter; front row Rita Keable, Pat Panter and Christine Duckworth. 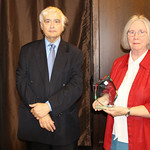 A Manx couple, John and Elaine Clague, pictured left, with Philip Mason in the centre, have been honoured by the English Bridge Union for their services to bridge in the Isle of Man. 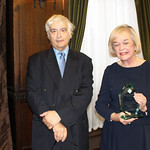 The presentation of the Dimmie Fleming Awards took place at the conclusion of the E.B.U. Manx Bridge Congress in Douglas on the 14th September 2003. John Clague is the President of the Douglas Bridge Club and the Manx Bridge Union and Elaine Clague is a Vice President of the Manx Bridge Union. Both have long and distinguished records of service to bridge on the island and they continue to play regularly and successfully.